We live in a chaotic, busy world these days with little to no margin for most people. With the New Year, most are looking for ways to make life simpler. Or at least I know I always am. A time to set up new routines, new goals, new methods to make life easier. Who wouldn’t want more time in their day and to spend less money on dinner? One part of our life that we struggle with is making dinner at home. We have entered into a new stage of life with three kids and as we still try to adjust, some days dinner just doesn’t get made. The baby isn’t cooperating or the two bigger kids aren’t cooperating. Some days I am the one not cooperating! We are on a journey this year to eat better, find time to work out, and be intentional in how we spend our time and money. We want to focus on what is important to us. I honestly don’t like cooking all that much and I had heard incredible things about the Instant Pot. On Amazon Prime Day in July 2017, like many of you, I bought an Instant Pot. When I took that bad boy out of the box I was overwhelmed. And it sat in the box for months. This all changed the first week of January. When I learned about this Freezer Meal Planning site, you bet I jumped on it to see what it was all about. 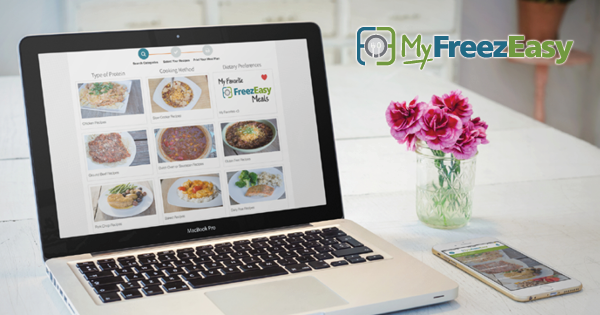 My Freeze Easy offers recipes for all kinds of meals, including slow cooker meals, Instant Pot meals, dairy free, and gluten free, to name a few. I could see the recipes on the site, but the real magic happens when you sign up for the membership. Once you signed up for the membership, you create a meal plan from the recipes that looked good to you (although they have pre-set meal plans if you want to go with what they have), and out comes the most glorious document. It shows you the entire grocery list you need along with how to prep the meals at one time to put into the freezer. We have completed a couple weeks of using My Freeze Easy and it has been a game changer. On the nights I don’t really want to cook, I have no excuse because I can put a meal in the IP and it is done in 25 minutes. I am even able to put dinner in the IP, work out, then come back to dinner ready to go. The magic is in prepping 20 meals in an hour and a half for the month which also allows for leftovers. 1. After I create my meal plan, it gives me the exact items I need to purchase. 2. I add the items I need to my WalMart grocery pick up, set my pick up time, and drive to the store where they load it in my car for me. No more wandering the aisles getting more items than I need (money and time saved). 3.I block off a chunk of time to put the meals together. The meal plan gives you instructions on how to prep all of the meals at one time in a step by step way that is easy to navigate. This shouldn’t take more than 2 hours for the 20 meals. 4.Label each freezer bag and put the ingredients together for each of the specified meals. Voila! You take the meal out of the freezer the night before to let thaw and cook according to the instructions given. If it’s not a one pot meal then you have to do sides, but that takes very minimal time, especially if you throw a 90 second rice pouch in the microwave. If you are looking for a way to save time and spend less on dinner, give My Freeze Easy a shot! How are you saving time and money this year? P.S.- Continue the conversation on Facebook! I would love to hear how I can help you on your journey. To receive up to date content, sign up to receive my free 7 Steps to a Prioritized Life on the home page and posts will be delivered right to your inbox. If Facebook isn’t your favorite social media site, you can connect with me on Twitter, Pinterest, and LinkedIn.